Technology Services of Iowa, LLC: Grads!! Not looking forward to hauling around a stack of college text books next year? Check out this Motorola XOOM! Only $599.99! Get your text books in digital format and leave the backpack at home next year! 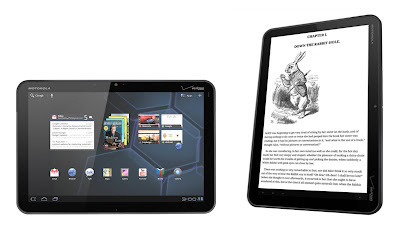 The Xoom is the first tablet computer to come with a dual core processor and expandable memory up to 64 GB! Studying has never been this cool! Tired of studying? Connect to Wifi and instantly stream the web, movies, or music to you! Procrastinating your studies has never been this cool! What ever your Graduates needs, your Kalona RadioShack can help! The Shack Has Got Your Back!